Only a few places leave an impression of world’s colliding as does the trip from Spain to Morocco. At its narrowest point, Spain and Morocco are separated by just 15 km by the Strait of Gibraltar. The closeness of the two countries tells a story of the history and power each country had with one another. Spain ruled a part of Morocco for 44 years and a lot of that influence is still quite evident today. The blending of both flavors, colors, and cultures of the two countries is an adventure not to be missed. You’ll explore the fullness of what Spain and Morocco have to offer, both independently and as countries, together. Best time to visit: Spring and Fall months of April to June or September to October because the weather is comfortably warm. Explore the ancient city of Seville that boasts a blend of the best of both worlds. Here you’ll discover a blast from the past with Gothic cathedrals, Flamenco clubs and an intoxicating mix of Spanish and Moorish influences. Be washed up in blue in Chefchaouen which was where Moorish exiles once fought. 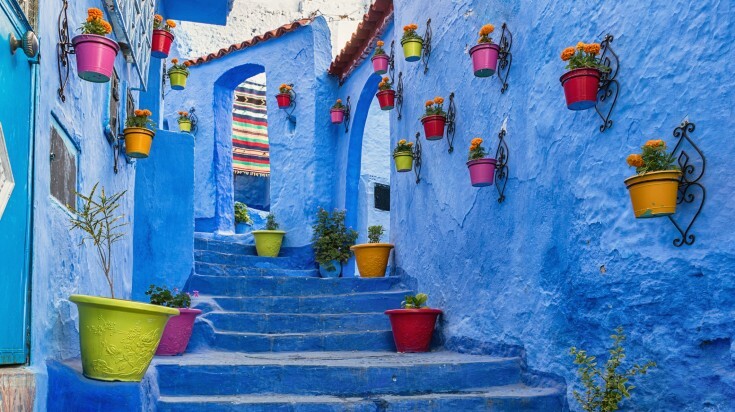 Visit the old town and meander down the striking streets of blue, while discovering artisan work and a traditional meal signature to northern Morocco. 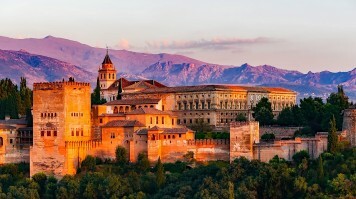 Venture the isles of “Muslim Spain” into the Andalusian towns of Cordoba and Granada where you’ll find a plethora of mosques, palaces and medieval quarters. Discover religion in all four corners: from a mosque to a cathedral to the Jewish quarter. Relish in the imperial city of Fez where you’ll wander around the heavily Islamic populated city and find spices and souk at play. Remember to visit a local home and try some of the many home specialties with Sufi chanting and dance. 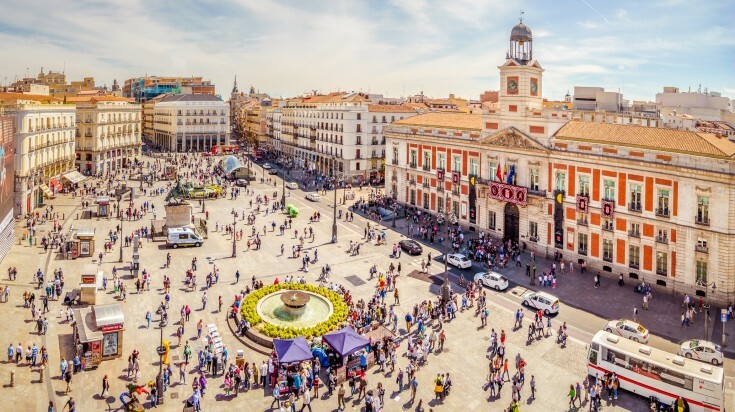 This 15-day explorer tour begins in Madrid and will bring you deep into the artistic culture of Spain, visiting galleries and intricate architectural buildings. Then, go through the culinary delights of Spain, Portugal, and Morocco while exploring the language, religion and ancient colors that give Spain and Morocco its distinct touch. With this tour. you’ll experience the collision of European and African influences that is not to be missed. 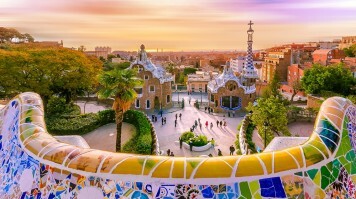 A 15-day intimate tour that’ll take you from Marrakech to Barcelona, where you'll venture through the beautiful ancient city of Seville, the artistic renaissance of Barcelona and deep into the Moorish towns of Morocco. Explore old-age cultures, Moorish architecture and the cross-culture of two countries that’ll leave you renewed from exploration. A round-trip tour that starts and ends in Madrid, this tour will take you through the local cultural centers of Spain through Morocco. 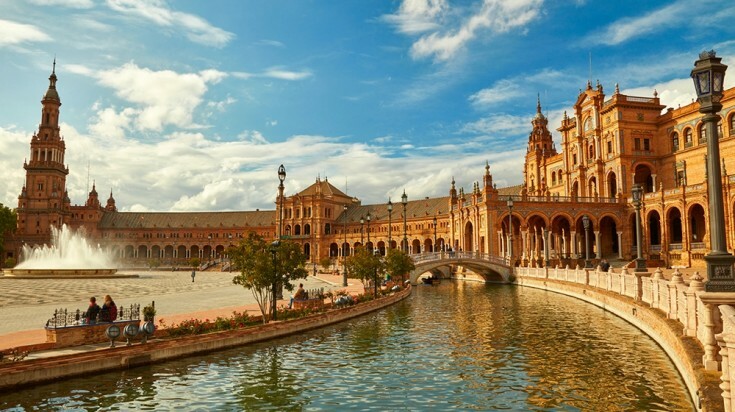 From the ancient cities of Seville and Granada to Tangier and Chefchaouen — this tour will bring you to the smaller cities of Spain and Morocco for a peek into the cultural history of the Moors and Spanish. Step into some of the most iconic towns and landscapes of Spain and Morocco and relish in the diversity, culture and historical richness of the region. 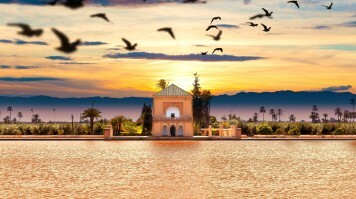 This 9-day tour will give you a look into the shared heritage and similar landscapes of Southern Spain and Morocco, where you’ll learn about the two countries bonded in the past and present. Arrive at the capital city and rush yourself into the historic hub of Spain. With palaces, baroque squares, picturesque cafes and leafy boulevards, spend the morning chasing back time at the many historic monuments at the heart of the city. Walk through the Plaza de Oriente and onwards to the Royal Palace, the official residence of the Spanish Royal Family and take a tour of the home notable for its wealth of art and collection of Spain’s finest artists. Spend the afternoon strolling the neighborhood of Los Austrias, the oldest part of the city where you can trace your steps back to the Habsburg dynasty. Make sure to make a pit-stop at Sobrino de Botin, the oldest restaurant in the world and Ernest Hemingway’s favorite spot during the Spanish Civil War. Then, rewind and spend the evening at the famous Museo del Prado, showcasing Spain’s greatest work of Goya, Rembrandt, and El Greco. End your night with a traditional tapas dinner and stay at the “center of Spain” in the neighborhood of Gran Via. Hotel Emperor on Gran Via is renowned for its rooftop views and exceptional service. Start the day early and head south to the medieval city of Toledo, half an hour away by train. 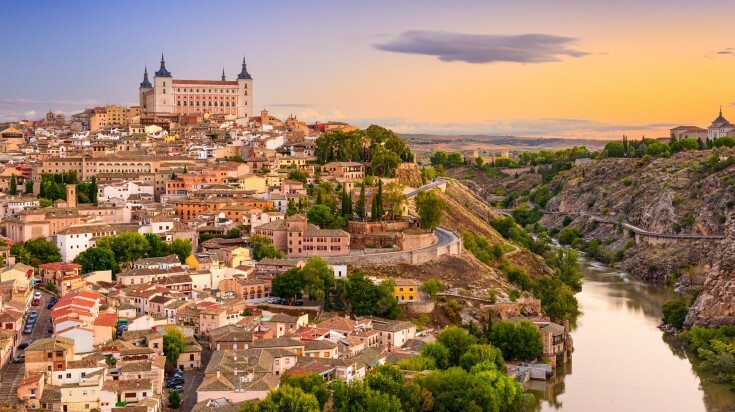 A city situated on rocks by the Tagus River, Toledo is a city representing three cultures — medieval Jewish, Muslim and Christian sentiments are displayed all throughout the city. This mixture of historic architecture and rich culture is where you start to see the shift and fusion of the eclectic blend of Moorish and Spanish influences. During the Spanish Golden Age, King Charles V chose Toledo as the main site for his court, making it the ideal place for Spain’s finest cathedrals and courtyards. From the gothic quarters to the Moorish-inspired buildings, Toledo showcases the best of three cultures. Visit the Monastery of San Juan de Los Reyes, built in the 15th century is one of the largest Gothic buildings in Spain. Be sure to also visit Museo Sefardi, one of Spain’s most treasured and best-preserved synagogues that is also a museum about the Jews of Spain. Finally, end your cultural tour at the Mosque of Cristo de la Luz, which is the oldest surviving building in Toledo and displays the story of Moorish worship in the country. 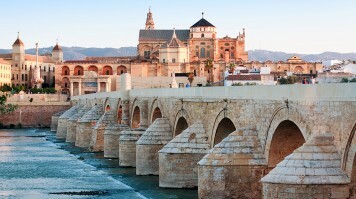 Then, head back to Madrid and catch a two-hour train ride to Cordoba to stay the night. Now you’re in Cordoba. Surrounded by the Andalusian mountains, the city is home to some of the greatest Islamic buildings in the world. Dubbed “Muslim Spain” until its fall in 1236, Cordoba is home to the breathtaking multi-arched Mezquita, a beacon and symbol of the city’s past as capital of Islamic Spain and one of Europe’s most cultured cities. Spend the morning exploring the winding, stony roads, and encounter plants, overhanging trees and flowers down Calleja de las Flores. Stop by Mercado Victoria for lunch before heading to Granada. Two-and-a-half hours away by train, Granada is home to some of the Moors’ greatest European legacies. Perched within the hilltops of the city is Alhambra, arguably one of the most astounding testaments of Moorish architecture today. It was once a palace and fortress of the Nasrid sultans. Wander the archways, bustling courtyards, fountains and palace gardens before catching the sunset at Alhambra, which is revered as one of the most breathtaking sights in the country. Spend the night in the city. Rise early and take a morning stroll through the Old Moorish Quarter, the Albayzin. Here you’ll find the original Medieval Moorish layout still intact, with narrow streets and traditional houses that spew old charm. It is the best place to explore Moorish architecture. Soak in the last views of Alhambra at Albayzin’s famous look-out point and head on the train for another two-and-a-half-hour train ride to Seville. Seville, considered one of the country’s most beautiful cities, is the artistic and cultural hub of Spain’s southern coast. The city’s architecture, vibrant and historic prowess houses some of the country’s most famous churches and buildings. Seville’s extraordinary Medjar, Gothic and Renaissance architecture is infused in on every path and corner of the city. Find yourself engulfed in the city of Moorish walls, Roman ruins and Baroque churches. In Seville, no trip is complete without exploring the Alcazar Palace, the royal court of King Pedro in the 14th century. Carry on your afternoon with a stop at the Seville Cathedral, the third largest in the world and climb up the Giralda bell tower for a breathtaking view of the city. End the evening exploring the Plaza de Espana and spend the night at Seville before heading out the next morning. Travel from Spain to Morocco today! Board the train to Tarifa, two hours away from Seville and take the ferry to Tangier — the gateway to Morocco. Located on the Strait of Gibraltar, Tangier lies at the intersection of Europe and Africa. At its highest point sits Kasbah, the oldest part of town, where you can explore the many whitewashed and yellow-painted houses row by row. The city is a huge port with monuments and museums that date back to centuries-old Moorish medina, with streets of boutique hotels and Euro-Moroccan cuisine. Pair that with long beaches, artisan gems and growing coffee culture, making Tangier a perfect spot to stop and be welcomed by Moroccan hospitality. Spend the night and be sure to stay around Boulevard Pasteur, where Art Nouveau and Art Deco collide, for the ideal place to feel the heartbeat of the city. Sitting between the Rif Mountains two-hours away from Tangier is Chefchaouen, once a fortress during the war between the Moorish and Portuguese. A blue-washed mountain village in Morocco’s north, Chefchaouen is like a world of its own. Meander through the narrow lanes and bright blue buildings on Plaza Uta El Hammam and find a gradient of colors from turquoise to ocean blue, indigo and cyan. Enter the medina and go shopping for colorful blankets, lamp and other artisan items in the souks and see the intricate tile work that fills each residence. Spend the afternoon at a street cafe, sipping the city’s famed mint tea and watch the locals dressed in djellaba move about their day. Relish in the Moroccan day completely. Finish off the afternoon with a short hike up the city’s hilltop to an old abandoned Spanish Mosque that’ll give you a breathtaking view of the whole city. Stay the night at a riad, a traditional Moroccan guest house with an open roof and close off the day with glistening stars to bid the city goodnight. Go deeper and take the three-hour train into the medieval city of Meknes, once Morocco’s imperial capital. Often overlooked by its larger counterparts like Fez or Marrakech, but this small city packs a punch of its own. Be sure to marvel at the city’s greatest gem — the epitaphs of Moulay Ismail’s reign in the 17th century. The three set of fortifications are still partially held together with many relics still left to unearth. Roam the city’s many hidden streets and fine alleyways before witnessing the sunset at Bab El Mansour. This imperial gateway was once the pride of the city. The gate was built by plundered material from when the capital moved from Marrakech to Meknes and glistens in gold for the perfect reflection of the city’s long imperial history. Stay the night before heading to Fez the next morning. Just a short hour’s drive away, you’ll find yourself at Fez. A city that dates back more than 700 years, Fez is one of the oldest imperial cities in Morocco. Founded by Idris, the founding father of the Idrisid dynasty, Fez has become an important hub for trade and learning throughout the years. 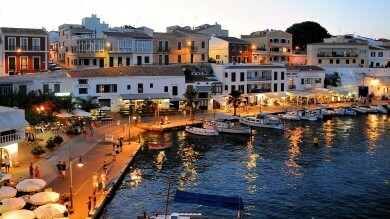 The city boasts architecture from the Golden Age, with some of its most iconic medinas, colleges, palaces and mosques. Strike through the medina, Fez el-Bali, and what remains of it. Peel through the many streets and get lost in the markets, fountains and local hammams that fill the streets of Fez. Then dive into a world of its own at Ville Nouvelle, the newest part of the city. Built by the French, this area of Fez carries its own charm with wide boulevards, contemporary shops and bustling crowds. Be sure to check out the Chaouwara Tanneries and shop for some famed leather and end it with a viewing of Medersa Bou Inania. This historic Islamic college displays some of the finest remnants of Marinid architecture and is a design lovers paradise. Unwind at the Jnan Sbil, one of the most beautiful gardens in the city before staying the night at a riad. From Fez, you can get to Casablanca in slightly under four hours by train. Arrive in Casablanca early afternoon and explore the Hassan II Mosque, one of the largest mosques in the world. Then stop by the Central Market for a full-scale look of local life with stalls and stalls of produce, spice, olives and seafood. Spend your afternoon by the water and take a stroll along Corniche, Casablanca’s beach promenade for the perfect end to a long worthwhile trip. 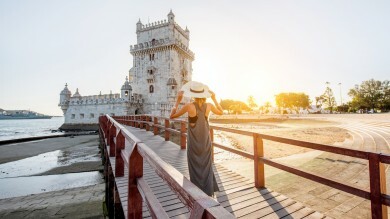 For visitors traveling to Spain, nationals from the US, Canada, New Zealand and Australia have a 90-day tourist visa as part of the Schengen area. Others will have to apply for a tourist visa directly through the nearest Spanish embassy. As for visitors headed for Morocco, visa is not required for all EU nationals and a list of other countries for up to 90 days. For others, a visa is a must and has to be applied through the nearest Moroccan embassy. Before you set off for the journey to Spain and Morocco, regardless the starting point, know about the visa requirements and prepare your paperwork accordingly. 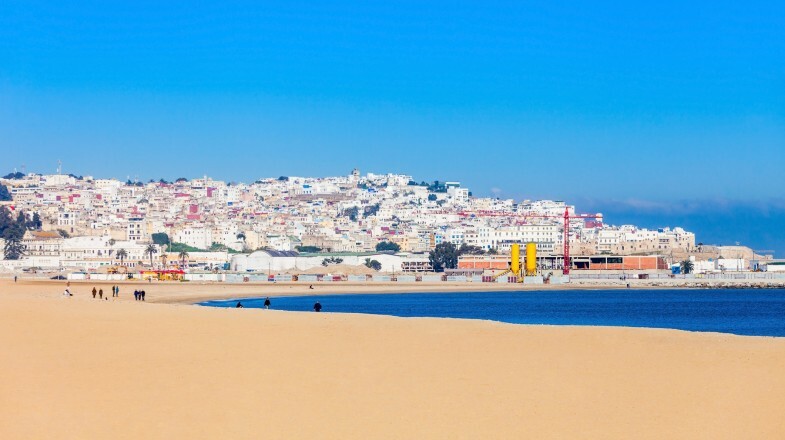 The best way between the two countries is by ferry with the most popular route being from Algeciras to Tangier. The port offers 34 sailings daily with many different ferry companies operating this route. You can also travel between the two countries by plane. Many cities in Spain fly out to Morocco, most notably from Madrid to Tangier which takes less than two hours airtime. Make sure you have the proper currencies when traveling between the two countries. Spain takes Euros and Morocco uses Dirham. The Dirham is a restricted currency which means it cannot be exchanged in a foreign country. So be sure to have both currencies ready before entering Morocco. Friday is a holy day in Morocco, so be ready for many stores and attractions being closed. As for Spain, many stores close mid-afternoon for rest and siesta. Located in two different continents and yet so close to each other, not only in proximity but also in design and culture, Spain and Morocco are two countries rooted together in history. A trip to Spain and Morocco is a journey that will inspire you and help you discover a whole new world.